where a = mean sun-earth distance = 149.5985 X 106 km. The plus sign in Eq. (2.4) is for the sun-earth distance when the earth is at the aphelion position and the minus sign for the perihelion position. The solution of Eq. (2.4) gives values for the longest distance equal to 152.1 X 106 km and for the shortest distance equal to 147.1 X 106 km, as shown in Figure 2.3. The difference between the two distances is only 3.3%. The mean sun-earth distance, a, is defined as half the sum of the perihelion and aphelion distances. The sun's position in the sky changes from day to day and from hour to hour. It is common knowledge that the sun is higher in the sky in the summer than in winter. The relative motions of the sun and earth are not simple, but they are systematic and thus predictable. Once a year, the earth moves around the sun in an orbit that is elliptical in shape. 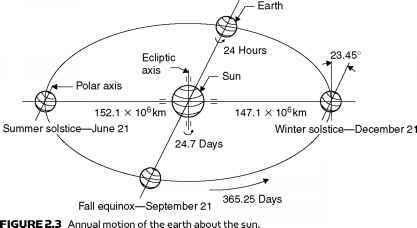 As the earth makes its yearly revolution around the sun, it rotates every 24 h about its axis, which is tilted at an angle of 23° 27.14 min (23.45°) to the plane of the elliptic, which contains the earth's orbital plane and the sun's equator, as shown in Figure 2.3. FIGURE 2.4 Annual changes in the sun's position in the sky (Northern Hemisphere). sun rises earlier and sets later each day and the sun's path gets higher in the sky. On June 21 the sun is at its most northerly position with respect to the earth. This is called the summer solstice and during this day the daytime is at a maximum. Six months later, on December 21, the winter solstice, the reverse is true and the sun is at its most southerly position (see Figure 2.4). In the middle of the six-month range, on March 21 and September 21, the length of the day is equal to the length of the night. These are called spring and fall equinoxes, respectively. The summer and winter solstices are the opposite in the Southern Hemisphere; that is, summer solstice is on December 21 and winter solstice is on June 21. It should be noted that all these dates are approximate and that there are small variations (difference of a few days) from year to year. FIGURE 2.5 Definition of latitude, hour angle, and solar declination. For the purposes of this book, the Ptolemaic view of the sun's motion is used in the analysis that follows, for simplicity; that is, since all motion is relative, it is convenient to consider the earth fixed and to describe the sun's virtual motion in a coordinate system fixed to the earth with its origin at the site of interest. 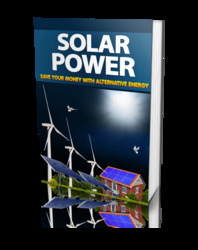 For most solar energy applications, one needs reasonably accurate predictions of where the sun will be in the sky at a given time of day and year. In the Ptolemaic sense, the sun is constrained to move with 2 degrees of freedom on the celestial sphere; therefore, its position with respect to an observer on earth can be fully described by means of two astronomical angles, the solar altitude (a) and the solar azimuth (z). The following is a description of each angle, together with the associated formulation. An approximate method for calculating these angles is by means of sun-path diagrams (see Section 2.2.2). Before giving the equations of solar altitude and azimuth angles, the solar declination and hour angle need to be defined. 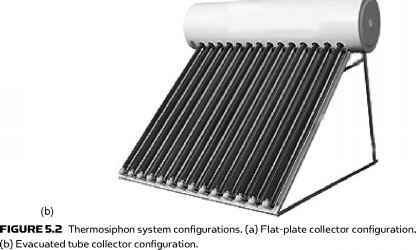 These are required in all other solar angle formulations. Where does the sunrise and sunset in the northern hemisphere? Where is the sun positioned during midday in winter?